I like to prepare the flock for winter, and I like to do it early. I’ve always found being an early bird and preparing well in advance for new seasons, or even batches of chicks, is a good idea for a few reasons. Firstly, by the time some seasonal items are really necessary, they can be sold out. But if you purchase your supplies a month or more in advance, not ony will you be prepared, but in some cases it can also save you some money. Secondly if you’re not properly prepared, for example, with a heated waterer, if freezing temperatures hit before expected, you’ll really regret not thinking ahead. You may have to scramble at changing and defrosting waterers like mad, rather than sitting back and letting the equipment do the work! But lastly, if you don’t prepare the flock for winter prior to winter’s arrival, you’ll find yourself pushing a wheelbarrow full of partially frozen chicken poop through a foot of snow to wherever your compost pile is… only to find that it, too, is covered in a foot of snow. Then you could be forced to look at a poop covered snow pile until next spring—ugh. Now that I’ve made your aware of all the very unpleasant situations you could be in if you don’t prepare the flock for winter, please read my Top Ten list and make sure you know what you need to get so your flock will be ready for what comes. 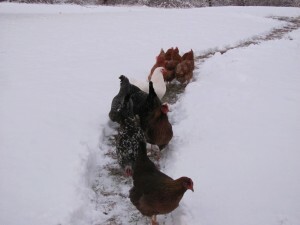 My chickens stick to the path in the snow! Make sure you’re prepared with a plan to keep fresh, unfrozen water in your coop. For myself, I make sure have a working heated waterer base for my waterers. You could also choose to purchase a heated waterer with a built in heater. NOTE: the water heater bases are for metal waterers only! If you own a plastic waterer unfortunately you will not be able to use it with a heated waterer base. Heated waterers or waterer bases are not always required—some here at My Pet Chicken choose to change out the waterers once or twice a day—but here in Connecticut, our water heater gets a pretty good amount of use. Use your judgement, or advice from chicken keepers in your area, to make a good call about the best way for your family to keep your flock’s waterer from freezing. Make sure you clean your coop early. Do it preferably long before it may start snowing, because it’s not very fun to do when there’s a lot of snow on the ground! If you follow a cleaning schedule other than the deep litter method, which we use for our large flock, then make sure you’re prepared to do what’s necessary to following the proper cleaning schedule during the winter. Make sure you have a shovel available close to the coop, if you live in an area with lots of snowfall. You’ll need it close by so you can shovel snow away from the door to collect eggs, shovel out the run so they can stretch their legs a few times throughout the winter, and—for smaller coops, especially those with flat roofs—so you can knock or shovel snow off the roof. You don’t want to risk your coop roof caving in on your feathered friends under a heavy load of snow! For those who also have automatic chicken doors and plan to use them during the winter, please make sure that they have some type of overhang, so that ice will not freeze them open and give predators easy access to your feathered friends. You’ll also want to make sure the snow doesn’t pile up in front of the door, preventing it from opening or closing (use the shovel from #3 above!). Here you can see that to help prepare the flock for winter, we’ve fashioned a small overhang that covers the power box and hinges of our automatic door very nicely. Have petroleum jelly readily available to help prevent your feathered friends with larger combs from getting frostbite. While this is not required, we like to do it to keep our feathered friends’ combs warm so they don’t get too cold during our cold Connecticut winters. Remember, this is not a treatment for frostbite; it simply helps prevent frostbite by keeping the skin from getting chapped and vulnerable. Don’t use any ice melt or salts in areas your chickens have access to, or in areas where runoff could find its way to them. These products are very toxic to chickens. Use something with traction, like sand or dirt instead. Stock up on chicken grit, since your chickens will not necessarily longer have access to the ground outside. They need grit to aid digestion. Have cracked corn or another high calorie treat available. Whether you mix it in with their feed, or throw it in on top of the snow in their run. Treats and feed high in fat provide the extra calories that will help keep them warm. Heater? In some cases, yes. We don’t recommend heating your coop long term. However, when the temperature drop precipitously, having a coop heater you can use on a temporary basis to help ease the transition is important, especially if your flock is not made up of a lot of cold hardy chicken breeds, so they don’t get too cold. Additionally, if you have younger birds in your coop that are smaller or not fully feathered yet, then it wouldn’t hurt installing a transitional heat source. For transitional needs, I suggest the Sweeter Heater. The sweeter heater is larger than most other heaters, but has little risk of being a fire hazard, unlike standard heat lamps that cause many coop fires every winter. Sweeter Heaters can easily be hung or mounted in most coops near your chickens’ roosts. This is something that I do because I live in the north where we often have very bitter winter weather. 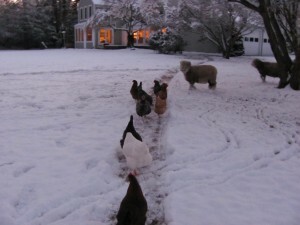 Remember, a heater is certainly not required for your flock, and in most circumstances they do fine without one. But if you didn’t choose cold hardy breeds and you live in a cold weather area, it’s something you should consider adding so you will have it on those rare occasions you need it. Last of all, be sure your coop is pest and predator proofed, because many rodents move into barns and coops during the winter, and it’s not something you want to be dealing with in the cold, or when it’s already t0o late! I hope I’ve given you some ideas of ways you can prepare the flock for winter, or improve your prep this winter to keep your flock happy and healthy. Please keep in mind these practices are what I use for my flock, which is large and very diverse, and that some of these measures are not required for smaller flocks or people in different regions. You should also take a few moments to read over our advice on 8 things NOT to do in cold weather for your chickens. Whatever you do, don’t procrastinate—you’ll want to prepare the flock for winter soon. Now, I’m off to make sure that my flock and family are all prepared for winter. Happy Prepping! We live in CT and the winters can be quite cold. We have 9 girls and have had GREAT luck “heating” the coop with a ceramic reptile “bulb” purchased at the pet store – it is in the shape of a bulb and screws into a clamp light but gives off no light. We plug the clamp light into a thermostat we got on Amazon designed to turn on if the temps go below freezing but turns off at 40*. 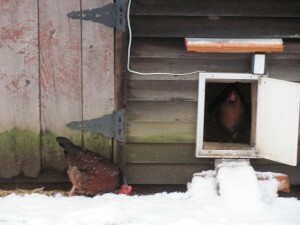 It warms the coop just enough so we don’t have to worry about our girls getting too chilly! I live in Tucson, Az and my coop is not wood. It is chicken wire with lattice work over it and a tin roof. It does get cold here at night, 30-40 degrees. It does not freeze often. My question, do I need to cover my coop in a double layer of thick plasric or plywood? It seems to be pretty cold in the coop. This is my first winter with 7 laying hens.